Body Fabric: Available in HT500 or MultiCam® Black Camo Cordura®. Two-layer weatherproof construction and water-resistant zippers. Made in the USA from domestic and imported components. Handmade in small batches by the San Francisco-based industrial-chic retailer Mission Workshop, the Rhake backpack and Capsule camera insert fit right in with the functional techwear aesthetic of its home city. In matte black (also available in camo, grey, and olive) and lacking in loud logos or designs, these packs have a minimalist, understated style that suggests a utilitarian and military orientation over flashy fashion-forwardness. Overall, the Rhake + Capsule look pretty good – but these packs are clearly about function over form. If you told me that the Rhake was originally developed for military paratroopers or something, I’d believe you. I feel more badass just wearing it. The Rhake’s black HT500 fabric is a custom material made exclusively for Mission Workshop. It feels like a cross between heavy-duty nylon and canvas, and is mostly matte with a slight sheen under direct light. On their website, Mission Workshop claims that unlike nylon fabrics, HT500 “looks better the more you use it”, with a water and stain-resistant coating that will develop a patina. I’m curious what kind of patina they mean; I love a good patina on leather goods, but not sure what patina on a synthetic fabric like this would look like. Regardless, the water-resistant properties (including water-resistant YKK zippers) are a huge plus for anyone who plans to use this backpack biking through a rainstorm or, say, hiking the Andes during rainy season. Which I might – who knows? Pockets, compartments, pouches everywhere! The main job of a backpack is to contain your belongings, and man, does the Rhake do that well. It seems like whatever I could possibly need to store in the backpack, there’s a specialized compartment hidden away somewhere for it. At 21” tall, it’s a pretty burly bag, but makes good use of its volume. I was able to fit everything I’d need for a full, active day running around the city: a 15” Macbook Pro (in a dedicated padded laptop compartment), charger, several notebooks, a water bottle (in a hidden mesh pocket that can be zipped away when not in use), a Sony a6000 mirrorless camera, and other sundry items – all with room to spare. The Rhake is rectangular, with two large horizontal straps / quick-release buckles across the front securing two zippered organizational pockets (with interior zippered mesh compartments for small accessories, notebooks, etc.) to the main body. There’s even a paracord key leash for you to clip your keys onto inside the left pocket. The exterior horizontal straps / buckles would also be useful for holding a jacket, or even a tripod. The zippered laptop compartment is conveniently accessible from the exterior of the backpack, and Mission Workshop claims it’ll fit up to most 17” laptops. It’s padded, so I neither feel it sticking into my back when I wear it, nor have to worry about my computer getting dinged up and scratched. There’s also a 10” tablet compartment in the front, also accessible from the bag’s exterior, should you need to double down on your electronics. Underneath the front two zippered pockets is a large horizontal compartment at the bottom the bag. I’d use this one to stash chargers, headphones, and other miscellaneous items. On top, Mission Workshop’s signature rolltop “hood” is a 22-liter main compartment that rolls up when not in use and is held down by a waterproof velcro seal. 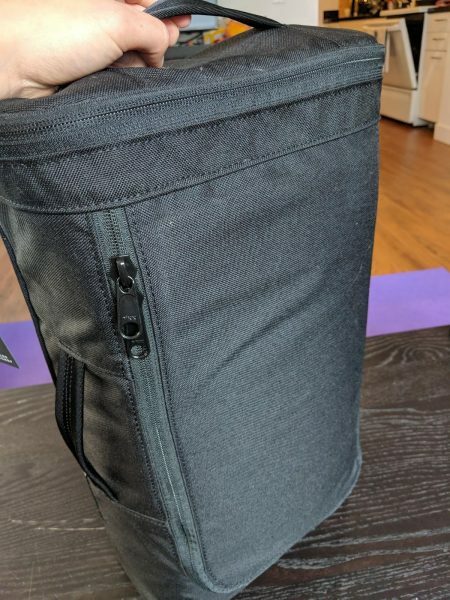 Finally, on the left of the rear side, the Rhake has a hidden zippered 10” x 6” pocket with a mesh pouch that pulls out of the pocket to hold a water bottle. 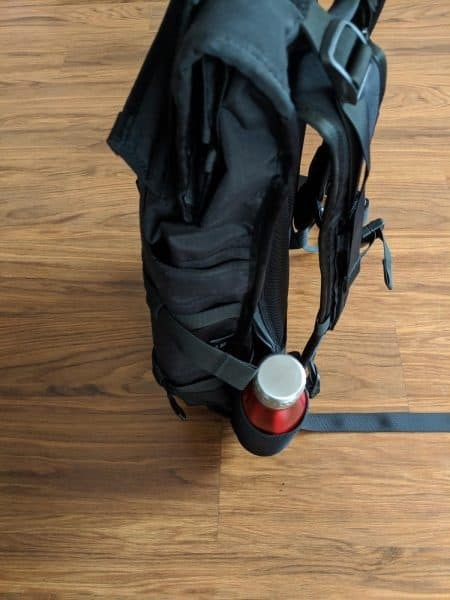 It’s elastic, so can fit multiple bottle sizes – a pet peeve of mine with previous backpacks. Honestly, the Rhake is SO good at holding all of my stuff that the biggest risk is me forgetting which of the bazillion compartments/pockets/pouches I put something in. If you’re intending to carry the Rhake around all day, either on a rugged foreign adventure or bike-commuting through the streets of SF, it’s critical that the backpack is comfortable. Luckily, the Rhake has been smartly designed. 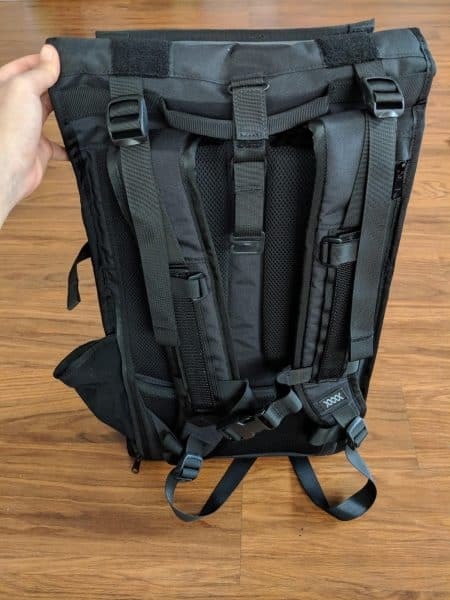 The back panel is well-padded and perforated for ventilation (though admittedly not quite as good at ventilation as backpacks with suspended back panels which leave a gap between the bag and your back). The lower lumbar panel helps out your back as well (and is also a pass-through for any wheeled suitcase handle – a nice touch). The harness straps (including a sternum strap) are adjustable, as would be expected on a backpack of this quality / price point. The Capsule. In short: I love it. Aesthetics-wise, the Capsule takes the efficient utilitarianism of the Rhake but pares it down to an even cleaner, more minimalist, streamlined silhouette. No buckles or straps on the outside – just a top handle, a side handle, and two sets of zippers to access the interior either through the top or the front. All exterior sides are well padded to keep your camera gear safe and secure. The Capsule comes with interior dividers and elastic velcro straps to be configured however you like – and here’s where it really shines. It’s clearly been designed with a working photographer’s needs in mind. I can easily stash 5, maybe even 6 lenses in these padded compartments. Or a few lenses and a flash. Or a backup camera body and a couple lenses and accessories. The list goes on. The dividers and straps are completely removable and adjustable, so the Capsule can quickly become the perfect fit for whatever combination of equipment I choose to carry. 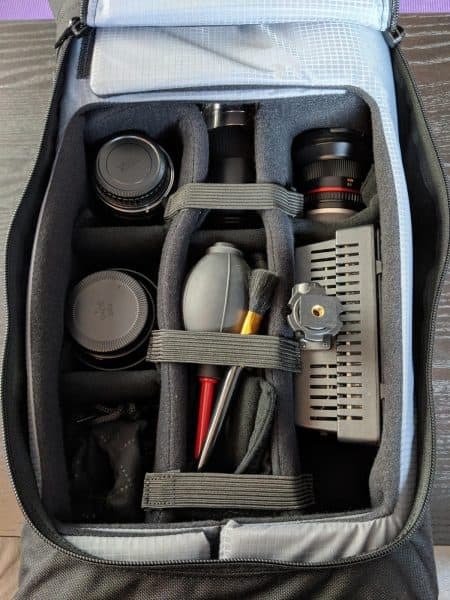 The thing I love MOST about the Capsule is that I can zip it open from the top to store or remove my camera (lens pointed down) without even needing to pull the Capsule out of the backpack. Super useful. 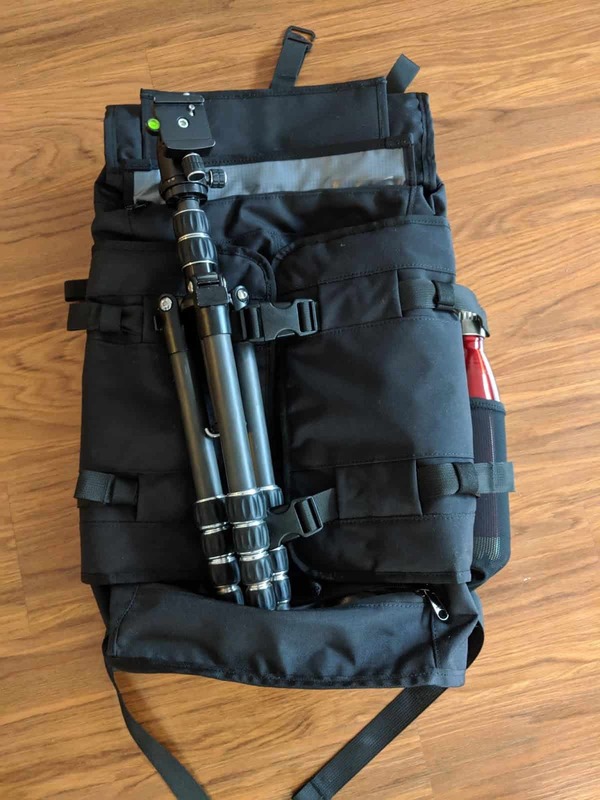 I do wish that the Capsule came with a longer shoulder carry strap so I could more easily carry it on its own outside of the Rhake, for quick indoor shoots and the like. For some reason (maybe to keep costs and the price point down? 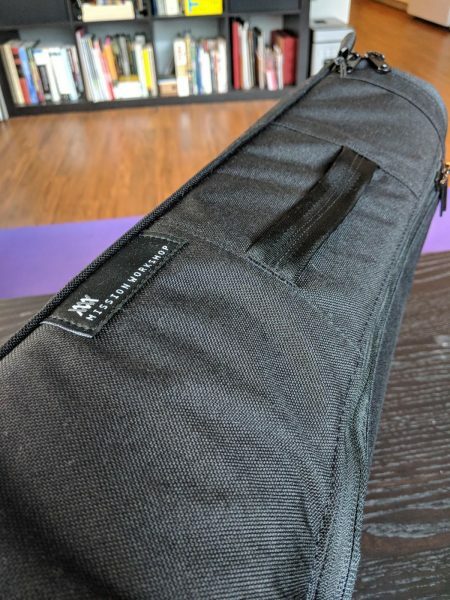 ), the Capsule is made of black nylon instead of the custom HT500 fabric of the Rhake, but I guess it doesn’t need to be quite as water and stain-resistant if it will spend most of its time inside of the Rhake and therefore less exposed to the elements. Top-notch build quality, in everything from the custom weatherproof fabric to the design details like a key leash and pull-out bottle holder. I expect the Rhake + Capsule to last me a very long time through plenty of hard use. So many compartments and pockets! The Capsule is a photographer’s dream, and fits perfectly inside the Rhake to become a super efficient, utilitarian, weatherproof, photographer’s backpack. 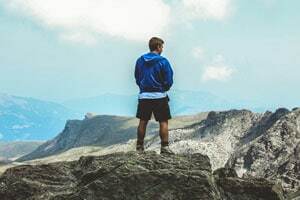 Both packs are kind of pricey, but worth the investment if you plan on taking your expensive camera equipment on rugged adventures – urban, wilderness, or otherwise. What Different Styles of Photography are there? I am an avid photographer and love the outdoors. ShutterTalk is the website where I share things that I have learned about photography, and help other photographers, new or experienced, enjoy their cameras and taking pictures even more. Are Mirrorless Cameras Better in Low Light? Why Do Photographers Wear Black? We participate in the Amazon Services, LLC Associates Program, an affiliate advertising program designed to provide a means for us to earn fees by linking to Amazon.com and affiliate sites.